The official logo for the movie, featured on the home release covers. Jurassic World is a 2015 American science-fiction/adventure film and the fourth sequel in the Jurassic Park franchise. Directed and co-written by Safety Not Guaranteed director Colin Trevorrow (with the aide of screen-writer Derek Connolly), the film stars Chris Pratt and Bryce Dallas Howard (daughter of famed director Ron Howard) as Owen Grady and Claire Dearing respectively, along with other actors such as Iron Man 3 actor Ty Simpkins and The Kings of Summer actor Nick Robinson. Production companies Legendary Pictures and Amblin Entertainment joint-produced the film, with it being distributed by ‘Universal Pictures’. The idea for a fourth film began around 2004 but wasn’t fully realized until 2013. As they did before, Industrial Light and Magic created the CGI effects for the film in addition with Legacy Effects (previously Stan Winston Studios), who constructed the full-scale Apatosaurus animatronic for the film. Principal photography began around April of 2014 and wrapped around August of that year, some locations including Louisiana as well as locations in Hawaii. The movies total budget came to roughly 150 million dollars, and made a whopping 1.670 billion dollars in it’s total theater run, ranking it as of this date the fourth highest-grossing film of all time, as well as making it the second highest-grossing film of 2015, and currently the highest grossing film of the franchise. A yet-untitled sequel is scheduled for release on June 22nd, 2018. 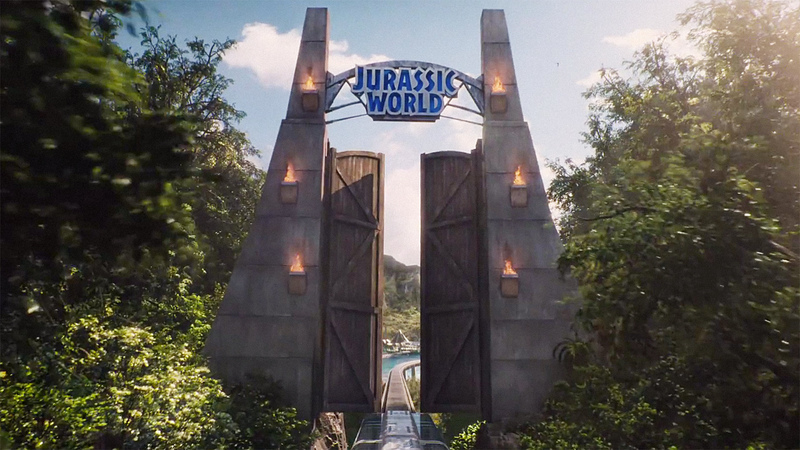 The gate to the Jurassic World theme park. opened on the same island since 2005, named Jurassic World. The Masrani Global Corporation is the new owner of the former company known as International Genetic Technologies. Brothers Zach and Gray Mitchell visit the park (sent by their parents who are getting divorced) to visit their aunt Claire Dearing, the operations manager. Due to her schedule, she assigns her assistant Zara Young to guide them around the park attractions. The Raptors Owen trains. From left to right (Charlie, Echo, Blue and Delta). hybrid dinosaur entitled the Indominus rex. He assigns Owen to evaluate the paddock for vulnerabilities. 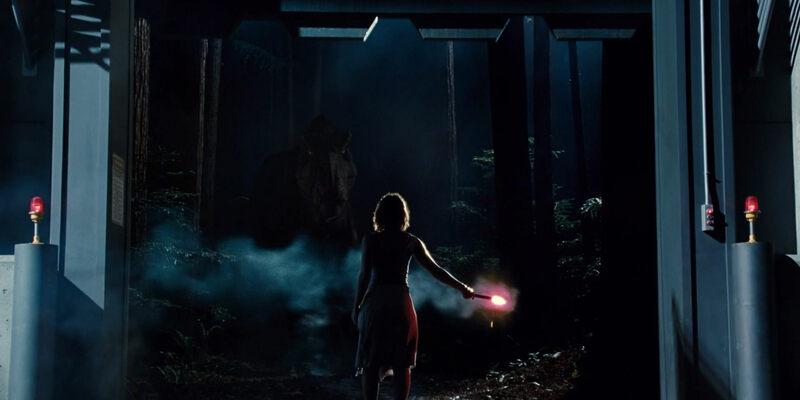 Owen warns Claire about the danger of raising the Indominus in isolation, pointing out its lack of socialization with other animals. 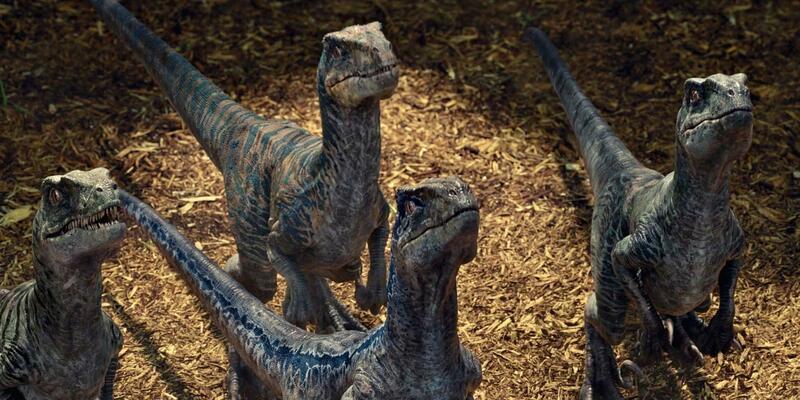 When the park staff learns that the Indominus appears to have escaped its paddock, Owen and two other employees enter the enclosure to investigate. Able to camouflage itself and mask its heat signature, the Indominus suddenly appears and devours Owen’s companions before escaping into the island’s interior. 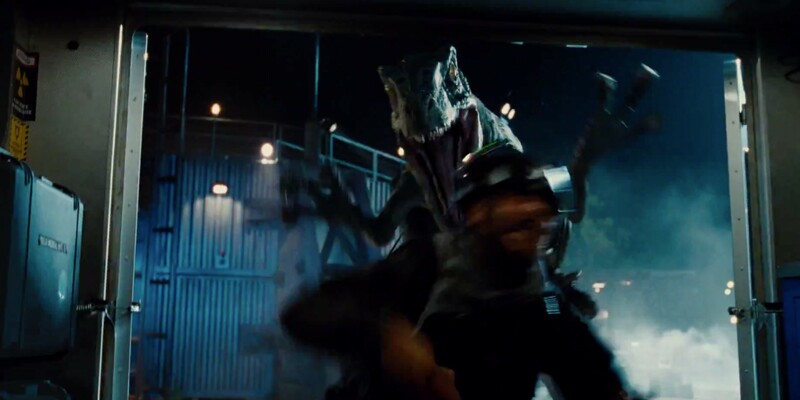 Owen orders the Indominus to be killed, but Masrani instead sends the parks security force (the “Asset Containment Unit”, or ACU) to capture it. When most of the unit is killed, Claire orders the evacuation of the island’s northern sector. Zach and Gray driving through the Gyrosphere Valley. manage to escape to the ruins of the original Jurassic Park visitor center. They repair an old Jeep and drive back to the resort. While Claire and Owen are searching for the boys, they encounter the Indominus and barely escape themselves. Masrani and two ACU troopers track down the Indominus via helicopter, but when the Indominus smashes into the park’s Aviary to escape the gunfire, it releases a flock of pterosaurs (Dimorphodon and Pteranodon, respectively) that attack the helicopter, causing it to crash into the Aviary. The pterosaurs reach Main Street and begin attacking the tourists (which results in the death of Zara, killed by the park’s Mosasaurus). Zach and Gray eventually find Owen and Claire at the resort as armed personnel shoot down the pterosaurs with tranquilizers. Claire calls Lowery Cruthers, a park employee, who informs them that Hoskins has taken control following the death of Masrani. One of the Raptors attacks a remaining ACU trooper. from the original park) to flee the island by helicopter with assets in-hand, in order to protect his research. Owen, Claire, and the boys find Hoskins at the lab packing up more equipment, and he reveals his idea to create more hybrid dinosaurs for military use. Before he can flee, a Raptor (Delta) breaks in and kills him, and soon gives chase to the group. Outside the Innovation Center, the Raptors corner Owen and the group. 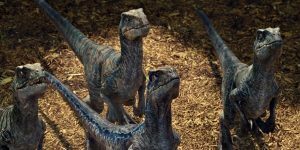 He re-establishes his bond with Blue and the two raptors before the Indominus reappears. Claire luring the T. rex out of it’s pen. resident Mosasaurus. The park is abandoned, and the survivors are evacuated to the Costa Rican mainland. Zach and Gray are reunited with their parents, and Owen and Claire decide to stay together. Back on Isla Nublar, the T. rex walks up to the helipad set over the park and bellows into the sunset. Chris Pratt – Owen Grady, a Navy veteran who previously trained dolphins. He is a park employee during the film who trains four Velociraptors (“Charlie”, “Echo”, “Delta” and “Blue) for use at the park. Bryce Dallas Howard – Claire Dearing, the park operations manager at Jurassic World and aunt of Zach and Gray Mitchell. During the film she goes into the park with Owen Grady to locate her missing nephews. Ty Simpkins – Gray Mitchell, the younger brother of Zach Mitchell and a dinosaur enthusiast. He and his brother are sent to Jurassic World for a “family weekend” when the Indominus rex escapes. Nick Robinson – Zach Mitchell, the teenage brother of Gray Mitchell. He and his brother are sent to Jurassic World for a “family weekend” when the Indominus rex escapes. Vincent D’Onofrio – Vic Hoskins, the security chief of Jurassic World. He oversees Owen and the Raptors and wishes to have Owen train them for military usage. Killed by Delta in the movie. B.D. Wong – Dr. Henry Wu, Jurassic World’s chief geneticist. He was the creator of the Indominus rex and the chief geneticist of the original Jurassic Park. Katie McGrath – Zara Young, the British personal assistant to Claire Dearing. She is killed during the Pterosaur attack on Main Street when she was eaten by the Mosasaurus. Irrfan Khan – Simon Masrani, the Indian CEO of Masrani Global and owner of Jurassic World. He dies when flying a helicopter to stop the Indominus rex. Jake Johnson – Lowery Cruthers, a Control Room employee who helped Claire and Owen during the movie. Omar Sy – Barry, one of the trainers at the Raptor Paddock who helps Owen with the Raptors. Lauren Lapkus – Vivian Krill, another Control Room employee who helps Claire and Owen during the movie. Brian Tee – Katashi Hamada, the Asian captain of the Asset Containment Unit. Killed when tracking the escaped Indominus rex. Judy Greer – Karen Mitchell, the mother of Zach and Gray as well as the wife of Scott Mitchell. Andy Buckley – Scott Mitchell, the father of Zach and Gray and the husband of Karen Mitchell. Universal Pictures announced on January 11th, 2013 that the sequel would be shot and released in 3-D with a release date of June 13th, 2014. Kathleen Kennedy announced that she would not be producing the film (choosing to work on Star Wars: The Force Awakens instead), leaving the job to her husband, Frank Kennedy. On March 14th, it was announced that Safety Not Guaranteed director Colin Trevorrow would direct the film, with Patrick Crowley co-producing. Trevorrow and Connolly wrote their draft script over the span of a few weeks and turned it into Universal on May 6th, 2013. Soon it was announced the release date would be pushed back to a then-unspecified date. It was re-written during the summer of 2013 and was then approved by Universal in September. On the tenth that same month, Universal confirmed that the title of the film would be Jurassic World, with actress Bryce Dallas Howard rumored to be joining the cast. By mid-October, child actor Ty Simpkins had been cast as the child lead with Jake Johnson being considered for a role. Nick Robinson was cast as the older brother character to Simpkins, while Josh Brolin was in talks to play the adult lead character. By mid-November, Brolin was no longer in talks for the film, with Guardians of the Galaxy actor Chris Pratt in talks for the lead role as a “rugged, ex-military man named Owen.” In January 2014, it was confirmed by Ron Howard (the father to Bryce Dallas) that he was confirmed for a role in the film. In February, Legendary Pictures had agreed to co-finance the film, providing an estimated twenty percent of the total budget (roughly thirty million dollars). That same month, Vincent D’Onofrio and Irrfan Khan had joined the cast, and Colin Trevorrow over Twitter confirmed that B.D. Wong (Henry Wu) had joined the cast and would play a bigger role than the first film. . On March 21st, French actor Omar Sy announced he had joined the cast. By the end of June that year, Katie McGrath, Judy Greer, Lauren Lapkus, Andy Buckley and James DuMont had joined the cast. Principal photography/production began on April 10th, 2014 at the Honolulu Zoo, and continued for four weeks at Oahu. By April, filming began at the Hawaii Convention Center, and moved to Kauai from mid-May to early June 2014. The full-size Main Street set was constructed and filmed on-location at the abandoned Six Flags resort in New Orleans. More scenes were filmed in Louisiana, and finally on August 5th, 2014 it was announced by director Colin Trevorrow via Twitter that filming had wrapped. As they had before, Industrial Light and Magic provided the computer-generated effects for the movie in conjunction with “Legacy Effects”, the alumni to the late Stan Winston, who provided the animatronic dinosaur effects. Aviation company “Scroggins Aviation Mockup & Effects” was hired to design and build the Blue Eurocopter EC130 T2 airframe body, known as “JW001” in the film,while “32TEN Studios” constructed the Jurassic World gates and other effects (explosions, etc). The musical score was composed by Michael Giacchino, who had previously written the score for the Jurassic Park games “Warpath” and “The Lost World: Jurassic Park”. Themes from the original films written by John Williams were incorporated into the soundtrack. A soundtrack album by Back Lot Music was released to the public on June 9th, 2015. The movie was first screened officially on May 29th, 2015 at the Grand Rex cinema in Paris, with it’s theatrical release showing in sixty-six territories over the span of June 10th-13th. In Japan the movie would be shown at the latest date, of August 5th. The movie was released at 809 IMAX theaters, and would be relaunched in IMAX by popular demand on August 28th for one week in the United States and Canada only. In North America, Jurassic World grossed 652.3 million dollars and 1.017 billion dollars overseas for a grand total of 1.669 billion dollars, dwarfing it’s 150 million dollar budget. During it’s theater run, it set and broke many records, some of which include becoming the first film in history to make over 500 million dollars in one weekend and the second film to generate one million dollars in “4DX” admission sales worldwide. Outside North America, the film was released in approximately sixty-three countries. IMAX ticket sales had grossed a total of 42.1 million dollars, with it’s largest markets aside from the United States and Canada being China, followed by the United Kingdom, Ireland, Malta and Japan. 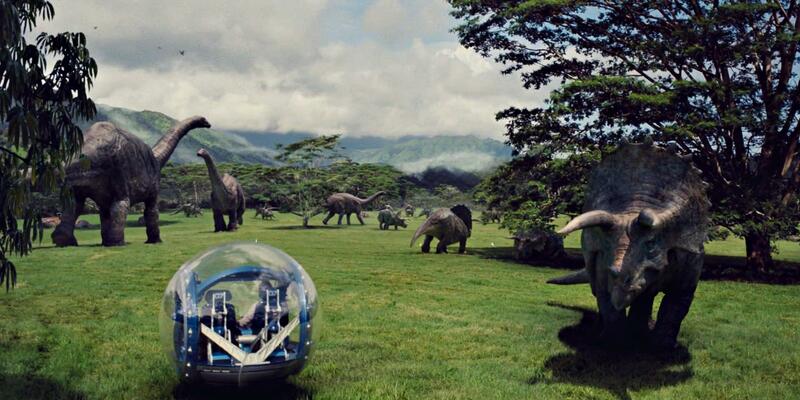 It soon became the highest grossing Jurassic Park film in twenty five countries. Across the board Jurassic World received praise for it’s special effects, soundtrack, acting and Trevorrow’s directing style. Based on 278 reviews the movie has a 71% rating and a 6.7/10 score on movie-review site “Rotten Tomatoes”. On “Metacritic”, the film has a 59/100 score based on 49 critics, meaning “mixed or average” reviews. In December 2015, the film was placed on the shortlist of potential nominees for the “Academy Award for Best Visual Effects” at the 88th Academy Awards by the Academy of Motion Picture Arts and Sciences (which it ended up not receiving).